This bread makes the perfect snack or light summer meal. 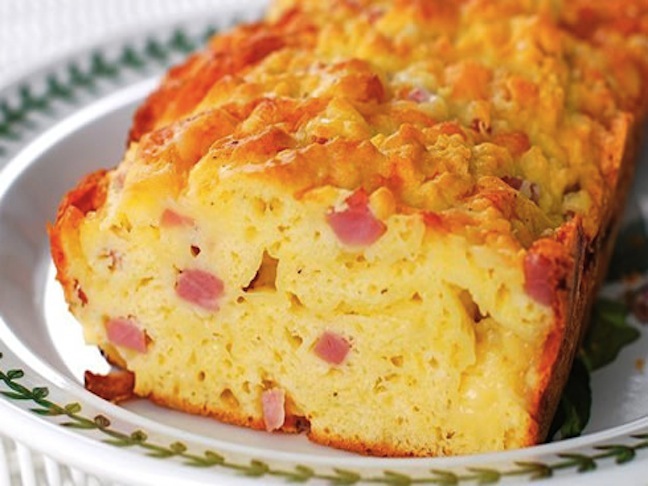 I love its dense chewy cheesiness studded with salty ham. I found that toasting it made it taste similar to a gourmet slice of grilled cheese. Its pebbly texture is also very appealing, giving it a rustic quality befitting the style in which it should be enjoyed. I’ve seen breads similar to this in baskets at fancy restaurants, but I think I’ll think with eating it the French way. On the back porch, for lunch, with Mom. Preheat oven to 350ºF. Butter a loaf pan generously with butter. In a medium bowl lightly whisk the eggs, then whisk in the milk and olive oil. With a spatula, fold the wet ingredients into the dry until just mixed. Fold in ham and cheese. Pour batter into loaf pan and smooth the top. Bake for 40-50 minutes, or until a cake test comes out with a few crumbs attached. Cool loaf in the pan on a wire rack for 5 minutes. Then, turn it onto the rack and cool completely.